For this episode of the Pyramid System’s All-Time team series, we travel to Washington D.C. to find the group that has improved the most since I started these articles, the Washington Nationals. With the city-centric approach of this league, the Nationals also get credit for both versions of the Washington Senators. That’s why I put the franchise in the American League, where the Senators played through 1971. As we will soon see, the addition of the Senators gives this combined team one of the deepest outfields in the American League. It also features what this system rates as the best pitcher in either league, Walter Johnson. And unlike the other names often mentioned in these arguments — Roger Clemens, Lefty Grove, Randy Johnson and Cy Young — Walter played his entire career for one team. The youngest manager to ever win the World Series and the man Casey Stengel replaced as manager of the New York Yankees, Bucky Harris made the natural choice for the skipper of the all-time Washington squad. It was under Harris that the Senators experienced their most significant success, winning the World Series in 1924 when Harris was just 30 years old and acting as player-manager of the club. He followed that with another American League pennant in 1925. Although Harris’ tenure in D.C. lasted just five seasons, no other manager in Washington baseball history has even approached his success. Given the Nationals’ propensity for managerial turnover, it’s doubtful anyone will anytime soon. There will be debate over who would win the Cy Young in the National League if this league were to be played out, but in the American League, the only question is who would be the second-best pitcher in the league. No other American League pitcher has won more games, pitched more innings, or recorded more shutouts than Walter Johnson. His 3,509 strikeouts rank second to Roger Clemens in American League history, but in this case, Johnson gives Washington the full credit of his 3,509. The only other pitcher in the American League even close to matching Johnson in tenure with one team is Bob Feller, but Feller wasn’t as dominant as long as Johnson was. From 1911-1915, Johnson posted a WAR of 60.5, which led all pitchers during that period. A distant second over that time span is Grover Cleveland Alexander with 40.8. Johnson’s total is more than the third and fourth pitchers have (Smokey Joe Wood 25.1 and Ed Walsh 23.9) combined. The only pitcher who can match Johnson for peak dominance is Pedro Martinez, but his seven seasons with the Red Sox pale in comparison to Johnson’s 21-year career with the Senators. No other pitcher can even compare with Walter Johnson to in this league, given the rule that players give teams credit only for seasons played under that franchise. The narrative of Walter Johnson carrying the Senators to the World Series title in 1924 is a little misleading, as it glosses over the legacy of one of the more forgotten fine players in baseball history, Goose Goslin. Walter Johnson alone was enough to guarantee the Senators’ pitching would be no worse than average, but the team lacked offensive punch, often finishing near the bottom of the American League in nearly all offensive categories throughout the 1910s. Aside from Sam Rice, the Senators had no notable hitters, but Goslin’s arrival in 1921 was the catalyst to change that. Behind Goslin, the Senators’ offensive went from terrible to average, and with Johnson leading the pitching charge, suddenly Washington was no longer “last in the American League.” With the Yankees going through a moderate rebuilding period, the Senators’ window had finally opened. Goslin led the American League in RBIs in 1924. He hit more home runs from 1924 through 1929 than all but three hitters in the league. The lone player of note from the second incarnation of the Senators, Howard would arrive in D.C. before the ’65 season in exchange for Claude Osteen. With the Dodgers, Howard had shown promise as a power hitter, finishing in the top 10 in home runs each year from 1962 through 1964, but he lacked plate discipline, walking just 123 times over the three seasons while striking out over 100 times in each. Modern sabermetrics would likely have had a kinder view of Howard’s contributions, but his high strikeout rate made him a frequent target of benchings by Walter Alston. 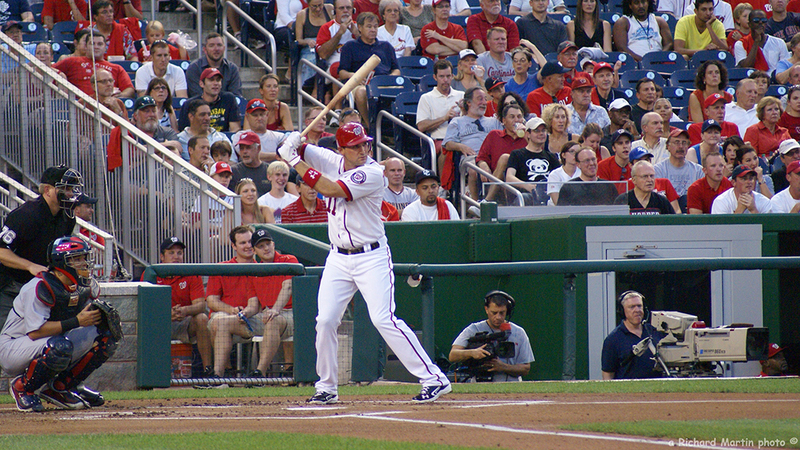 His arrival in Washington would lead to more playing time than in ny season he ever had with the Dodgers, but Howard remained in the category of “second-tier” hitters in the game. That would all change in 1967. An OPS of .849 may not seem impressive under modern standards, but in a year in which the league OPS was .654, his mark was good enough for him to rank sixth in the American League. Even more impressive was Howard’s ability to post a career-high 36 home runs in this pitcher-friendly year, Howard’s true breakout season. 1968 would prove to be even more fruitful for Howard as he left no doubt about being one of the most dominant hitters in the AL, leading the league in home runs with 44, slugging average at .552 slugging percentage and total bases with 330. The ’69 season would be the year Howard would put it all together, finally learning the plate discipline he had always lacked in his career. No doubt he had some help from his rookie Hall of Fame manager, Ted Williams. Howard would almost double his walk total, going from 54 to 102, while hitting a career-high 48 home runs and firmly establishing himself as one of the game’s superstars. In 1970, he once again led the league in home runs, but as the Senators began to experience ownership problems, Howard’s skills would start to deteriorate. The following year would prove to be Howard’s last year as an all-star caliber player and the last season of baseball in Washington for more than 30 years. Despite all their futility, the Senators in their final years in D.C. were assembling an outstanding team that would eventually become the backbone of some pretty good Minnesota Twins teams in the 1960s. Harmon Killebrew, Jim Kaat, Bob Allison, Earl Battey and Zolio Versalles were all Senators before they were Twins. However, in most of these cases, the players did not have enough experience in Washington to warrant consideration for this team. Killebrew did lead the American League in home runs in 1959 and had another solid season in 1960, but two seasons is not enough even for with a team as lacking in corner infield depth as Washington is. But there was an earlier Senator who was establishing himself as one of the American League’s premier players, and that was staff ace Camilo Pascual. It would take Pascual a few years to establish himself in the majors. He recorded a below-league-average ERA in each of his first four seasons, including 1956 when he led the American League in home runs allowed. But the same season would see Pascual record 7.7 strikeouts per nine innings, good enough for second in the American League and offering of what was to come. By 1958, Pascual had begun to piece it all together, posting a 3.15 ERA in an injury-plagued season that limited him to just 27 starts. That would be followed up by a 1959 season which saw him make a case for being the best pitcher in the American League, going 17-10 with 2.64 ERA, along with 17 complete games and six shutouts, both of which led the league. Pascual again would see his action limited in 1960 before the Senators bolted for the Twin Cities, where he would continue to cement himself as one of the game’s dominant starters. The absence of Pascual doesn’t hurt Washington nearly as much as it would have just a few years ago, thanks in large part to the emergence of Max Scherzer, but it still stings a bit to lose out on a productive starter for a team that is still lacking in starting pitching depth. Aside from being fronted by the best starting pitcher in either league, the Nationals feature one of the better outfields, headlined by Hall of Famers at the corners in Goose Goslin and Sam Rice and a former MVP winner, Bryce Harper, in center. 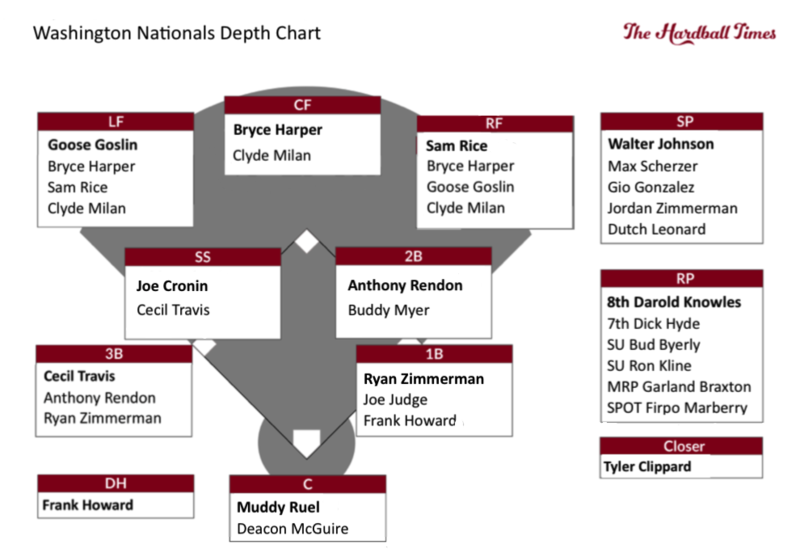 A few years ago, the starter would have been Clyde Milan, but Harper’s six All-Star Game appearances have left no debate as to who the starting center fielder on this all-time Nationals squad should be. Playing in the American League gives the Nats the benefit of being able to DH Frank Howard, who might be in the Hall of Fame if offense were the only attribute considered. But in this league, he is arguably the worst defensive player out of the over 700 position players featured in this series. Against lefties, in particular, Howard will be one of the toughest outs. Howard has one of the extreme splits in major league history. In 1968, he batted .224 with 28 home runs against right-handed pitchers. A respectable total, but nowhere near the .393 average with 13 home runs in just 200 plate appearances he put up against lefties that year. For his career, Howard was a .317 hitter against lefties compared to just .250 against righties. He will be featured prominently near the top of the order, in a position where left-handers will either have to pitch to Howard or walk him and face Hall of Famer Goose Goslin. The flexibility of infielders Ryan Zimmerman, Anthony Rendon and Cecil Travis will allow the Nationals to use a variety of infield lineups and is enough to make up for the fact that Nationals will have to fill seven positions with 10 players. A few years ago, I would have called Washington’s one of the worst rotations in either league, even with the presence of Johnson. But that was before Max Scherzer had won back-to-back Cy Young awards and established himself as arguably the premier hurler of this generation. Nos. 3-5 will still be difficult, but having Scherzer gives Washington a one-two combo capable of matching up with anyone. Even with Howard, this is a pretty weak lineup. Sam Rice may have gotten a lot of base hits in his career, but they were for the most part that, base hits. Rice never finished in the top 10 in either on-base percentage or slugging in any season. As the Pyramid Rating System scores it, his Hall of Fame case should be taken roughly as seriously as Ellis Burks’: A tremendous player in his own right, but not the generation-defining player you would expect a Hall of Famer to be. No offensive position is particularly weak, but none is particularly intimidating, either. Even the best position player, Goose Goslin, would be a surprise to see on an All-Star team. There isn’t enough offensive firepower to keep up with the likes of Boston and New York. Holding onto Bryce Harper might go some way towards solving this, but it will take a lot more than just Harper for this offense to pose a threat. They won’t be the worst offense in the American League. That distinction will go to Tampa Bay, but it’s arguably the second worst. I will say that this was one of the more fun lineups to put together because of the patchwork formation of this squad. It always seemed strange to me to consider Walter Johnson to be one of the greatest Twins in history, and part of the city-centric idea of this series was to feature Washington the way I feel it should be presented. Had the original Senators never left for Bloomington, this would likely be one of the dominating teams in the American League, on par with Detroit, Boston, the White Sox and other original-eight squads that never left. The Nationals have been a godsend by addressing some of the drawbacks of this team, mainly with starting pitching. Scherzer is putting himself into Hall of Fame consideration, and his addition gives some serious depth to what would otherwise be essentially a one-man rotation. The additions of Harper, Rendon and Zimmerman have also helped flesh out a lineup that before them lacked a power threat aside from Frank Howard. They will still be one of the worst lineups in the American League, but it’s no longer a joke. I would expect this Washington team to finish below .500 for the year. It would be-a toss up between the Nationals and Toronto for last in the AL East, but no team has improved itself more in the past few seasons than the Nationals. I might put Eddie Yost at 3B and leave Rendon at 2B vs. lefties. Although Myers was the better overall hitter than Yost, against lefties Yost has the better batting line. I don’t know how they compare on defense, so that might alter my choice. Presumably in that universe they would never have had Calvin Griffith as an owner and might have ended up with the full careers of Blyleven and Carew as well. Just a note on the Washington Senators/ Texas Rangers. Ted Williams was tremendous teaching these guys how to hit earning him a manager of the year award. These are always awesome – thank you! Looks like you are about half done, do you have a projected list for the next 5-10 teams you will do? Why is Gio Gonzalez taken ahead of Strasburg?